Looking for an easy yet filling dinner for busy weeknights? Search no further. This 20-minute pasta dish serves up four full servings of vegetables and chicken apple sausage boosts protein. Farfalle, aka bowtie pasta, is coated in a creamy, tangy sauce loaded with goat cheese, Parmesan and lemon. It's a meal that is sure to be a hit with kids and adults alike, and adapts well to different variations. If you don't have asparagus or peas on hand, substitute baby spinach, kale or broccoli. Is your family filled with pork lovers? Swap the chicken sausage for mild Italian sausage. Pasta cooking water is the key to silky, luxurious pasta sauces. The starch in the water helps it thicken and create a sauce that will cling to pasta. To get the effect of restaurant-quality sauces, undercook the pasta by about a minute, then cook the entire pasta, sausage and sauce mixture for 1 minute in the skillet to really coat the pasta and meld flavors. Per Serving: 377 calories; 18g fat; 27.8g carbohydrates; 26g protein; 58mg cholesterol; 681mg sodium. My wife hates peas, so I left them out of this recipe and added another two stalks of chopped asparagus. I didn't miss the peas, and this recipe was really good and easy. The chicken sausage was a really nice touch. Next time, I'm going to try it with an Italian sausage. I love goat cheese and asparagus, so this one was a no-brainer. I never used to keep my pasta water to add back into the sauce later, it's a game changer that definitely leveled up my pasta game. We made this recipe and it was so quick! Some nights when we have no idea what we are going to cook for dinner, we make this. It's filling and delicious. I can also sneak peas into my sons dinner without him noticing. 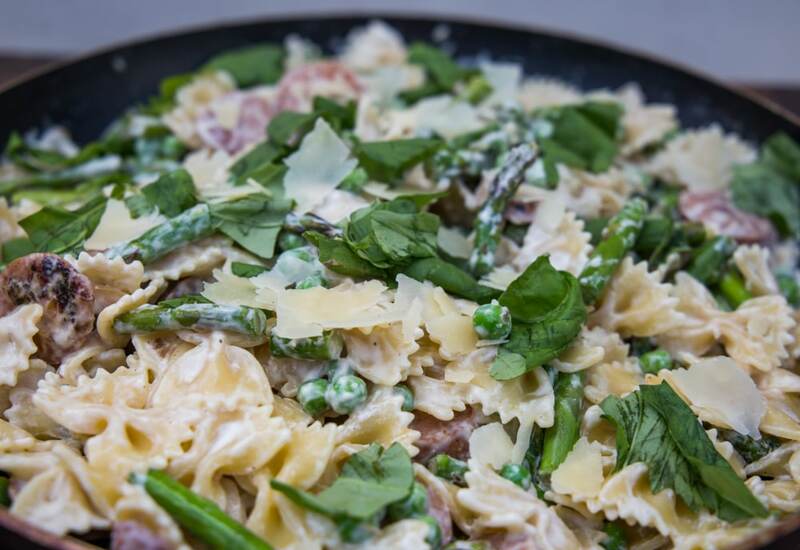 This is a great spring pasta! I used linguine noodles instead of bowtie, and skipped the peas. This was so easy, it's perfect for weeknights. Next time I may try spiralized zucchini to cut down on carbs. I used ground chicken instead of chicken sausage, it was really yummy. I also added red pepper flakes for a little spice.